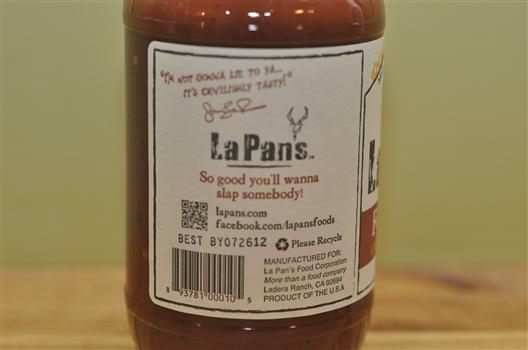 La Pan’s Foundation is a wonderfully complex BBQ sauce with a lot of flavor. 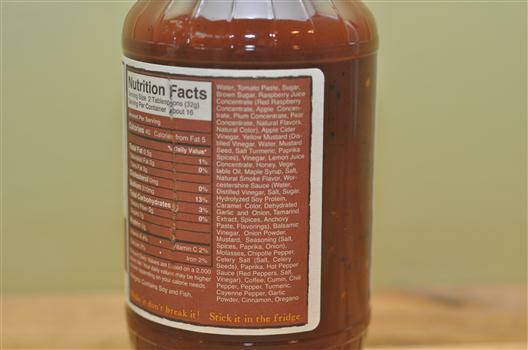 The ingredients are certainly remarkable – how about a sauce that combines raspberry, apple, plum, pear, lemon, coffee, cumin, maple syrup, garlic, cinnamon, oregano and more. Truly a cornucopia of sauce ingredients! Usually I’m not a fan of so many ingredients in a single bottle – but because these ingredients are all quite good and not polysyllabic chemicals, then it’s not an issue. Let’s have a deeper look shall we? The first thing I notice is a fairly traditional 16 ounce glass BBQ sauce bottle shape with black plastic cap. No innovation there, but no problem either. The label is well done – a great look, design, color scheme, and clarity. I’ll go on the record and say that I didn’t want to slap somebody after eating the sauce. And although it was certainly tasty, I’m not sure “devilishly” is the right adjective. Sure I’m nitpicking for fun right now, but when I think of something devilish in terms of food, I think of something really tasty but bad for you (or something really hot!). 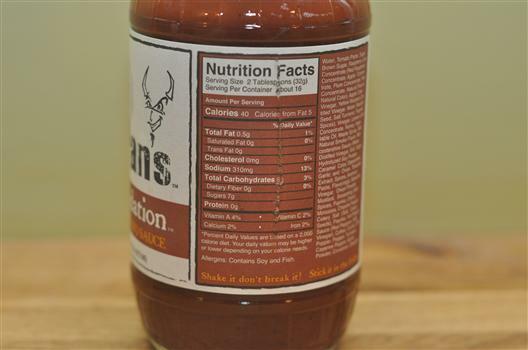 This sauce appears relatively healthy from my reading, so not too devilish. Add something like bacon, and it could be devilish. During the first whiff of the sauce, I get a strong mix of traditional BBQ sauce with a mustard blast – almost in equal amounts. I’ve called similar sauces “hybrids” – it’s not a mustard sauce nor a traditional BBQ sauce but a blend of both. The flavor of the sauce is also along these lines – a mix of “traditional” BBQ sauce and a mustard with two extra kicks. One is from the hot pepper sauce – resulting in a gradual, yet subtle simmering heat – but not enough to even be in the medium heat category. The other is from all the fruits and spices thrown in. My tastebuds were put through quite the workout trying to tell my brain what the hell to think! It’s good mostly, but makes it a little more difficult to stick in any particular category (kinda like Elton John’s music). Tasting the sauce is just fun. Taking a spoonful of it, it goes in about 4 unique stages as it oozes into your mouth and down your throat. Stage 1. Tomato – standard flavors are instantly recognizable – like a nice tomato paste. Stage 2. Mustard – ahhh, there’s a lot of mustard in here. And it’s not Dijon, it’s the yellow stuff. Stage 3. Fruit – Hmm. there’s something in there that’s sweet but different. It’s not just sugar, it’s not molasses, it’s fruity! Stage 4. Heat – Gulp. Hmmm. Ahhh, a little bit of heat going down the tubes. Just enough to make it interesting. I tried this straight from the bottle and on several foods. Dipped bread into it. Made a ham sandwich using this as a spread. Cooked up some chicken. And pan-fried some kielbasa with this on it (pictured). The flavors are a lot of fun when uncooked, straight from the bottle. When cooked, the complexity tones down a bit (as usual). What remains is still a good flavor with slightly less heat, tang, and fruit flavor then when uncooked. That is easily fixed by making yourself a little dipping bowl or pile on the side of the plate. Sometimes I’ll go on a run of getting the same sauce in the mail, week after week. It’s sauces like these that keep this website going and keep me entertained! 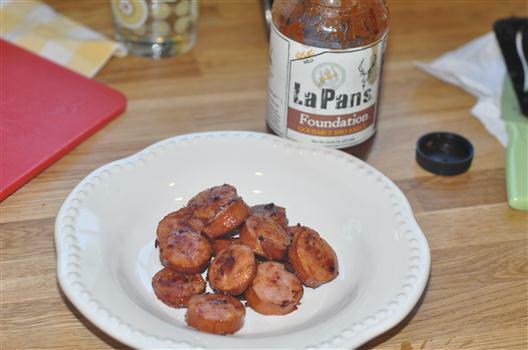 Founder Jon La Pan, says “our goal is to help anyone who has interest turn a $5 piece of meat into a $50 steak and look like a rock star in the kitchen!” Foundation is meant to be Jon’s spin on traditional barbecue sauces and I must admit to being a fan. YUM! Sounds like my kind of sauce! Loved the review Brian! Thanks Jay and Nick – much appreciated! This was a fun one to taste. Hi Brian – Thanks a mil for the accolades. Jon and I are thrilled to be crafting sauces that stand out to our families, friends and foodies such as yourself!